Tariffs are the simplest and most direct of the tools of trade policy: they are taxes on imports. Broadly speaking, high tariffs help to shelter domestic industries from international competition, whereas lower tariffs increase competition and benefit consumers through both lower prices and permitting a wider variety of products to choose from. Despite saying that taking back control of its trade policy is imperative and that the UK may have its own trade policy in under three weeks (30th March), the Government has yet to reveal its policy for UK tariffs. The Financial Times recently reported that the plan was to eliminate the majority of industrial tariffs and, in the same vein, Sky News reported on the Government’s intention to cut 80-90% of all tariffs to zero. Many business owners are anxiously awaiting further information, as they may have only a matter of weeks to adjust to changes that could seriously affect their business. In preparation for the Government’s official announcement, if there ever is one, we have analysed the current (EU) tariff structure, and in order to help others understand and interrogate any new structure, we set out some basic facts below. Tariffs – More than what meets the eye? Despite being the simplest trade policy tool, tariffs are complex; there are different types of tariffs, and they can be summarised at different levels of detail and using different statistics. All of these dimensions make a difference when analysing the degree of protectionism of a country. Broadly speaking there are two ways in which tariffs can be levied: ad valorem tariffs, which are levied as a fixed percent of the value of the imported good (e.g. the EU levies a 10% ad valorem tariff on cars) and specific tariffs, which levy a fixed charge per unit of a good (such as the EU’s tariff on dried sugar beet of 23 EUR per 100 kg). Some goods also face a two-part tariff, combining both an ad valorem tariff and a specific tariff. The percentage burden of a specific tariff depends on the price the importer pays for the good, which may vary across time and across countries. However, if we are prepared to average these prices we can convert them roughly into percentage terms – or what economists call ‘ad valorem equivalents’ (AVEs). In fact, the highest tariffs tend to be defined in specific terms (mostly in agriculture), so it makes a difference whether or not they are included in calculations. Without AVEs, the highest EU tariff in 2017 was 74.90%. With AVEs, the highest tariff in the same year was estimated to be about 276%. When countries publish their tariffs, they do so for products, or ‘tariff lines’, which are generally defined by the so-called Harmonised System (HS) of classification. The two first digits of the HS represent the chapter (category) that the product belongs to, and further digits are added to divide the products into more detail. With around 5,300 product lines, the 6-digit level of the HS is the most detailed level at which (virtually) all countries report their tariffs and trade. However, countries can add further digits to this core: The EU’s TARIC – the Integrated Tariff of the European Union – goes up to the 10-digit level (and some products are even broken down further into 12 digits). At the TARIC level, there are over 15,700 product lines. One also needs to decide how the detailed tariff lines are to be summarised. A simple average is, well, simple; it assigns the same weight to all product lines even if imports of some products are zero or negligible, and thus risks overstating the degree of protection. A weighted average, on the other hand, weights each tariff line by its share of total imports. This ensures that, where imports are very low, a very small weight is assigned to the tariff line. The result is a tendency to understate the level of protection, since low imports may be a direct result of a very high tariff not of a low protective effect. To understanding the impact of tariffs, it can make a difference whether one looks at the 6-digit level, or the more detailed TARIC level, and whether or not AVEs are included, as summarised in Table 1. 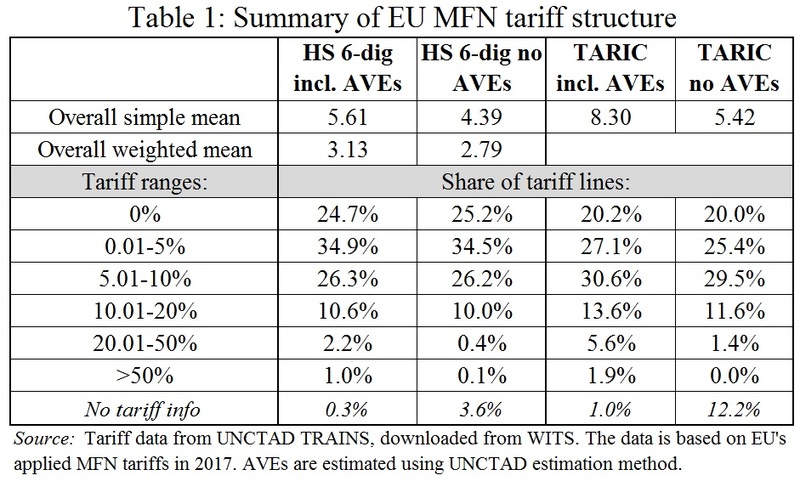 A simple average across all EU Most Favoured Nation (MFN) tariff lines gives an overall mean tariff of 5.61% at the 6-digit level (4.39% without AVEs), and 8.30% at the more detailed, ‘TARIC’, level (5.42% without AVEs). TARIC is higher because tariff schedules tend to become more fragmented the higher the protection offered, as governments try to tailor their restrictions to the precise products that need to be protected (or producers bought off). At the 6-digit level, where trade data is readily available, the weighted average tariff can also be calculated. This is lower than the simple average, at 3.13% with AVEs and 2.79% without. 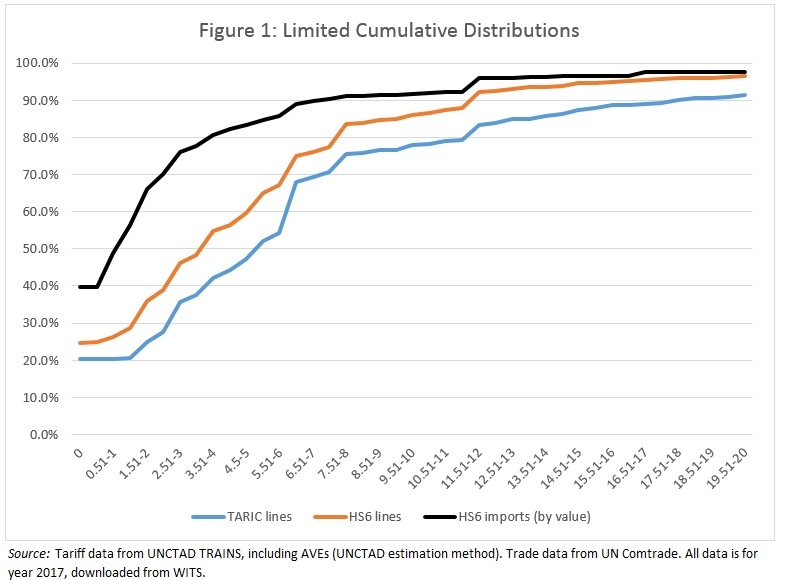 Figure 1 gives the cumulative shares of tariff lines at the 6-digit and the TARIC level (including AVEs), and also the cumulative share of imports. 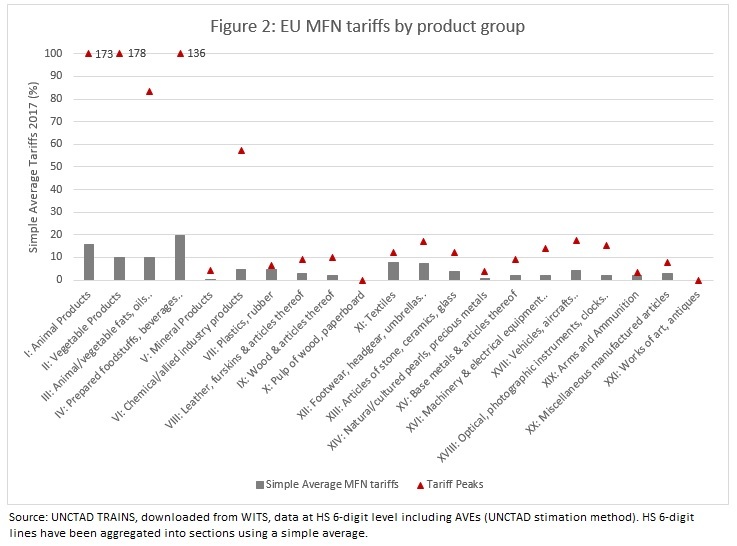 That is, it shows what proportion of tariffs are at or below a particular level and how much trade there is in those products. (We plot only up to tariffs of 20% because the vast majority of tariffs are below that level.) Indeed, 96.5% of all 6-digit tariff lines and 91.4% of TARIC lines are 20% or below. Looking at the UK’s imports from countries facing MFN tariffs shows that around 40% of such imports (by value) are in products facing zero tariffs. Overall, around 83% of UK imports from these countries are in products facing tariffs of 5% or less. As already alluded to, tariffs vary considerably across product groups. Figure 2, therefore, reports average tariffs and tariff peaks (the highest tariff in the group) by product group. While most have relatively low tariffs, there are some serious peaks particularly in the agriculture and food sectors, related to products such as dried sugar beet, whey and modified whey products and certain types of mushrooms. Since the Government has not yet published any details on its proposed tariff structure, we have to rely on the limited information that has been leaked to the media. However, the reports that the Government plans to cut 80-90% of tariffs leaves many questions unanswered: what is the level of disaggregation (e.g. 6-digit or TARIC level)? ; will it cut 80-90% of the non-zero tariffs or is it that 80-90% of tariff lines would end up at zero? ; which 80-90% – from the top or the bottom of the distribution? Abolishing all tariffs of 10% or below would, for example, cover 81% of HS 6-digit tariff lines and around 72% of TARIC lines (excluding the tariffs lines which are already zero), but would leave the really restrictive tariffs in place. It would cut the simple mean tariff from 8.3 to 5.3 at the TARIC level (or 5.6 to 2.8 at the HS6 level). Conversely, if the Government were to cut tariffs from the top end of the distribution, it would have a much larger impact, but producers would need to be given sufficient time to prepare for such changes. There have been some indications that tariffs on certain agricultural products such as beef, pork, lamb, sugar, dairy and cheese could remain in place, as well as tariffs on products such as cars and ceramics. Without further detail, it is difficult to accurately identify the exact products that could be affected. Notwithstanding this, while removing tariffs on all products bar these exceptions would indeed probably eliminate 90% or more of tariff lines, it would still leave many of the highest tariffs in place. In fact, many of the tariffs that are 50% or higher fall into these excluded categories, and would therefore potentially remain in place. Another way to look at this is that, excluding any tariff lines which are already zero, a mere 55 HS 6-digit tariff lines (1.5% of the non-zero lines) account for 50% of the imports that face positive MFN tariffs. Thus even if tariffs were eliminated on all tariff lines except these 55 (i.e. about 98.5% elimination), around 50% of taxed imports would still face tariffs. Tariffs are complex, and although averages are useful, the real impact is felt at the very detailed level of product classifications. Although one can speculate about what the changes will entail, businesses need reliable and detailed information in order to prepare. These decisions have a real impact on people’s livelihoods and with less than three weeks to go until Britain may leave the EU without a deal, businesses still do not know the conditions they may face in the event of a ‘no deal’ Brexit. This was levied on certain tobacco products, codes 2403110000, 2403191000, 2403199000. The countries used for the purpose of this analysis are 24 countries identified here as trading with the EU on MFN terms. While this may not capture all the countries trading on MFN terms it provides a reasonable approximation. Odd, when main objection that has been made to the Irish backstop is that it would or could keep us in the EU Customs Union indefinitely and so prevent us “striking trade agreements round the world” , that the government plans to give away the bargaining chips we would have in trade agreement negotiations by cutting or eliminating most of our tariffs.